These high-waist yoga leggings are designed with a wide, elastic-free waist and fast-dry, premium fabric so that they maximize your comfort and let you move freely as a flamingo. Eco-friendly and handmade in Germany using a flexible flatlock seam for extra durability and comfort. 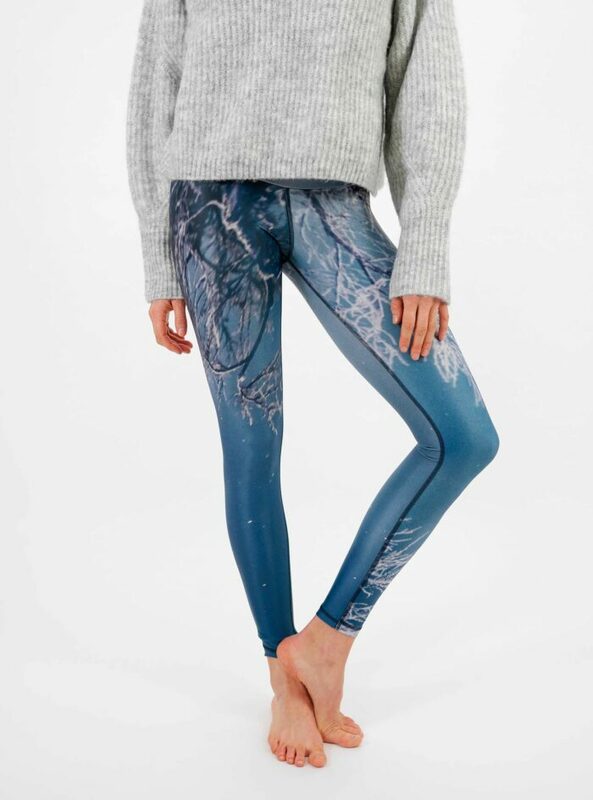 All our yoga leggings are made from recycled materials and have unique and bold patterns that make you stand out. They are designed for yoga but also suitable for pilates, barre, or other medium-impact activities. With excellent UV protection, they are also ideal for SUP and SUP yoga and other water activities. The fabric used in our leggings is thick and durable techno-fabric, which doesn’t lose its shape, fade or pill over time. It is silky smooth, soft, breathable and lightweight, similar to fabric used in swimwear. We´ve chosen this fabric not only because it’s made sustainable, but also because it´s light and yet very robust! It has excellent shape retention properties and fit thanks to the use of LYCRA® XTRA LIFE™ fibre. Our leggings are intended to fit very snug at first wear and the fabric may feel stiffer than what you may be used to with other leggings. Please note that the fabric will quickly ease to fit your body and relax by up to half a size. Washing instructions: Machine wash cold (30° or 40°), do not tumble dry, don´t use fabric softener. Hang dry. Please view our Size Guide before placing your order. If you need help finding the right size, please drop us an email. These leggins give me extrapower when Im training! Perfect for practise sport. Colour is amazing!! fabric dries fast and feels like other skin. Wonderful fabric <3 Feels like other skin and very comfortable! I don't mind to pay quality, permanence and it's ecological too! Just perfect!